This iconic trench coat is a key piece for any winter wardrobe. It is water resistant with a breathable cotton-mix outer finished in beautiful powder pink with the interior lining finished in a vibrant matching pink tartan design. This sophisticated yet practical trench coat has a fully adjustable belt with a beautiful chrome buckle with matching buckle-fastened cuffs that can be tightened to keep out those cold winds. 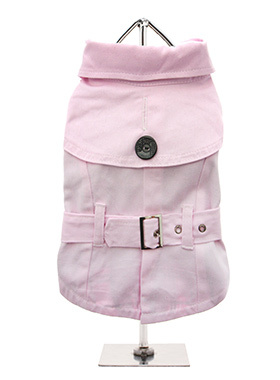 The trench coat is synonymous with understated style, sophistication and elegance, perfect for your pup.